Salmon Cake Sliders with Spicy Mayo are a crispy, spicy and flavorful appetizer that’s easy to make and will really wow a crowd. Or you can be completely selfish and just make them for lunch for yourself. It’s up to you! And what do I spy in the back there? Why I think that might just be a shiny new KitchenAid 5-Speed Diamond Blender… Did I mention I’m giving away one of them today? More on that in a second though. A platter of these is absolutely irresistible…. I don’t think I’ve told you all this before, because I’m a cook and I’m supposed to love allll aspects of cooking, but sometimes I really hate prep. All that chopping and dicing and mincing can get kind of exhausting, especially when your dealing with peppers and celery and salmon. That’s exactly which this blender has become my new best friend. Not only does this blender make a killer smoothie, it actually chops things for you. For real, it chops all your veggies up into perfect little pieces, better than anything I could ever do by hand. 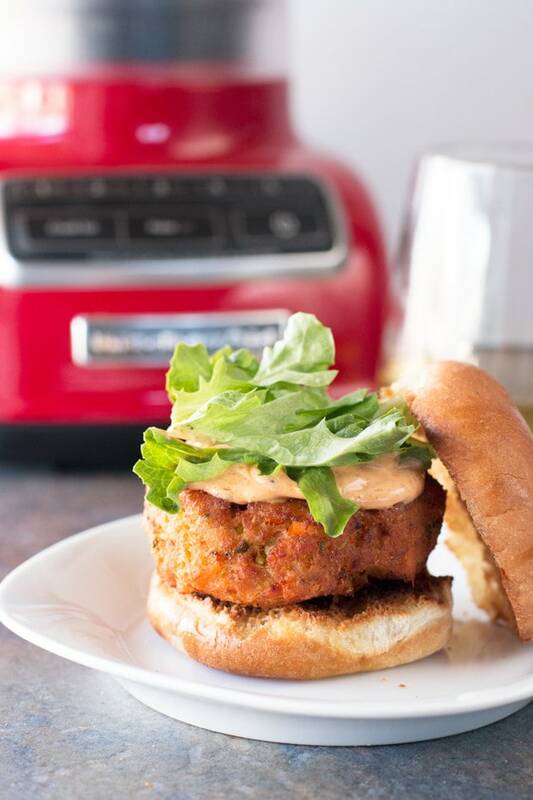 Making these salmon cake sliders was so easy, I can’t even describe to you the ease. Talk about a smart appliance, am I right? 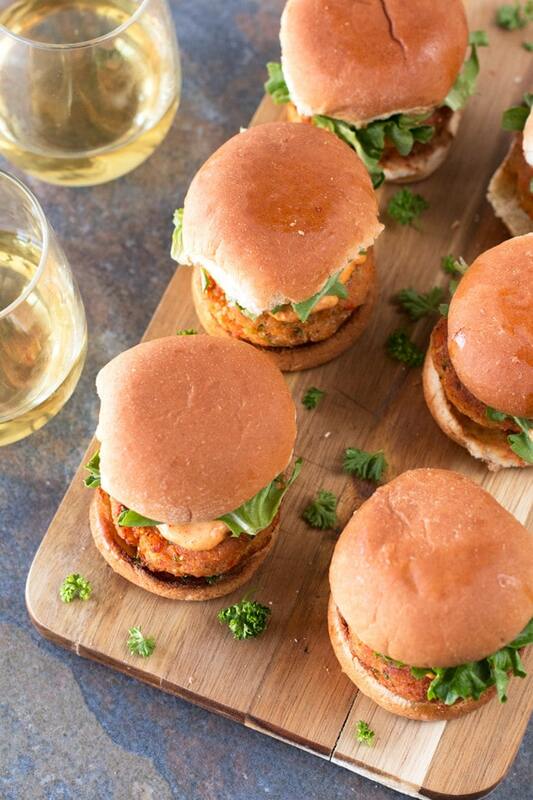 You absolutely have to make these sliders for the Super Bowl this Sunday, whether you’re hosting a party or not even watching the game. They are SO flavorful and hands-down the perfect tailgating food. 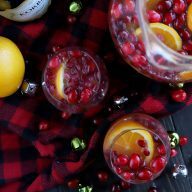 Enough with the chips and dip (at least until I share my favorite one later this week)! 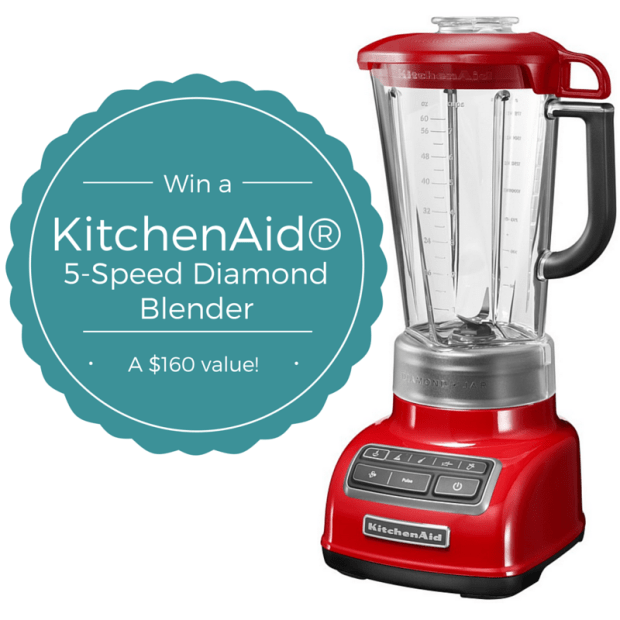 I’m lucky enough to be able to offer you a chance to win your very own KitchenAid® 5-Speed Diamond Blender today! Seriously, you want to get your hands on one of these. I use mine at least once a day, for REAL. 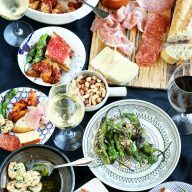 Check out the giveaway below the recipe! Disclosure: I received free product from KitchenAid® as part of this giveaway and post. As always, all opinions and recipe are my own. Thanks for supporting the brands that support Cake ‘n Knife! 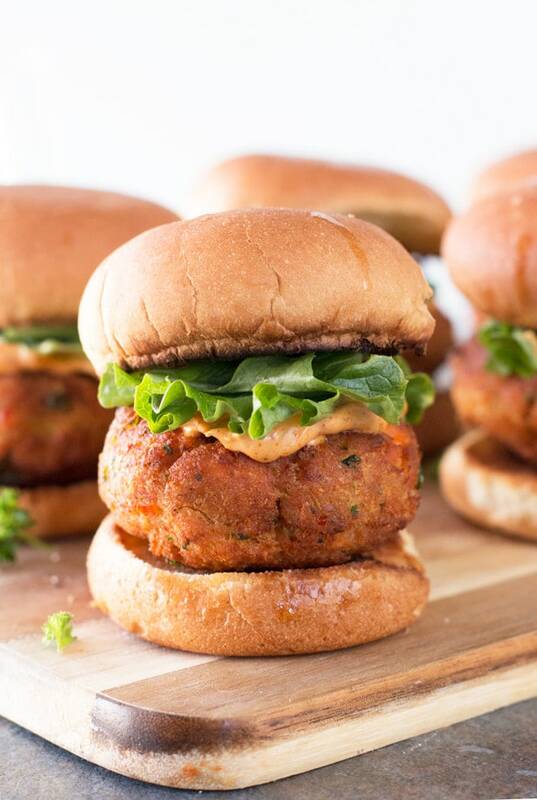 Crispy, flavorful salmon cakes make the perfect two to three-bite sliders for any party. In a small bowl, whisk together all the ingredients for the spicy mayo. Season with salt and pepper to taste. 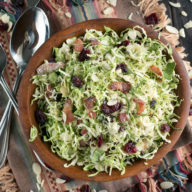 Set aside in the refrigerator until ready to serve. 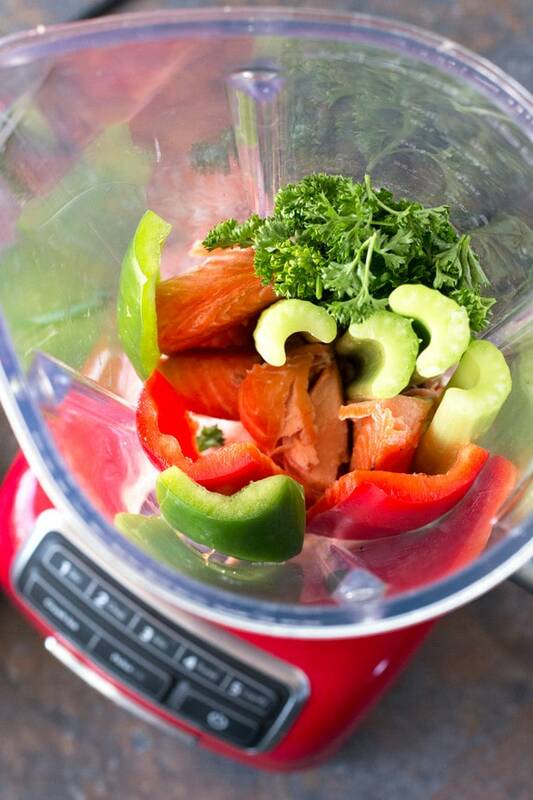 Add peppers, celery and parsley to a KitchenAid Diamond Blender and pulse on the chop setting until the ingredients come together and the veggies are minced. Add the salmon and pulse a couple more times until the salmon is broken down but not mushy. Pour the contents of the blender into a large bowl. Stir in the breadcrumbs, eggs, seasoning, lemon juice, hot sauce, garlic powder, salt, pepper and capers. Cover the mixture with plastic wrap and refrigerate for 30 minutes. Remove the chilled salmon mixture from the refrigerator and form thick 2 to 3-inch cakes (depending on the size of your slider buns). Heat 1-inch of oil in heavy skillet over medium-high heat. Working in small batches, fry the salmon cakes for approximately 3 to 4 minutes per side, or until golden brown and cooked through. Remove the cakes to a paper towel-lined plate to drain. 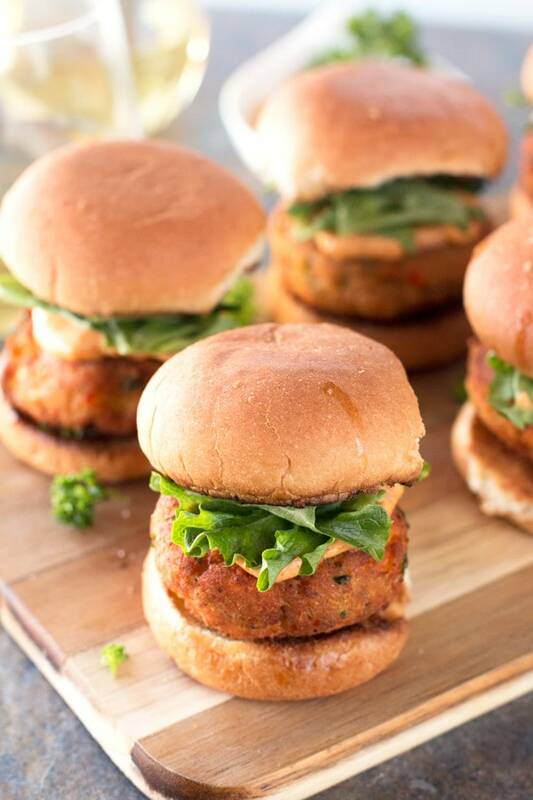 To assemble the sliders, add the salmon cakes to the bottom halves of the slider buns. Spoon a generous Tbsp of the sauce on top of each cake and finish with some salad greens. 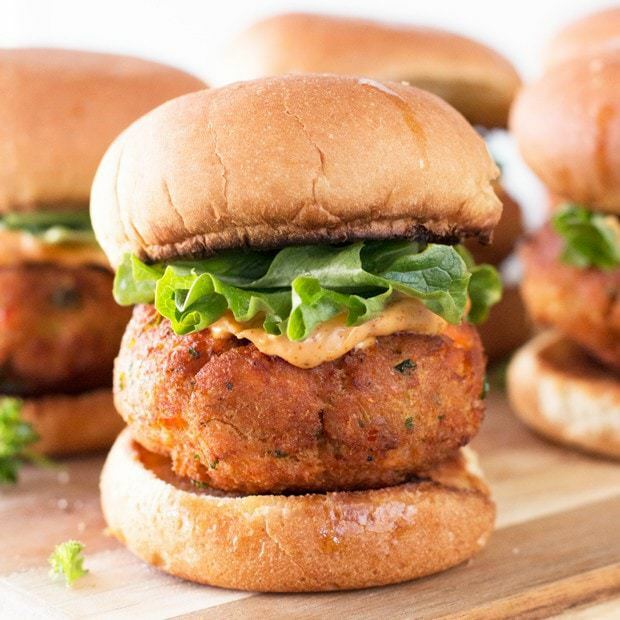 Top with the other halves of the slider buns and serve immediately. Ready to win one of these bad boys for yourself?? See the Rafflecopter below to enter to win this amazing blender! 1. Enter the giveaway through the Rafflecopter widget below. Everyone gets a free entry! You can enter multiple times, up to 15 total entries by following the giveaway sponsors on social media. (If you’ve followed in the past, that counts! Just enter the information as prompted.) All entries will be verified. No purchase is necessary to win. 2. The giveaway is open until Tuesday, February 9, 2016 at 11:59 p.m. CST. One winner will be chosen at random and e-mailed within 48 hours. Winners must claim prize within 48 hours of initial contact. The retail value of the prize is $159.99. Prize listed above is the only one available. 3. Open to U.S. residents with a valid shipping address only. Must be 18 years of age as of February 1, 2016. With my brand new blender, I would first make a Chocolate Peanut Butter protein smoothie. Might sound boring, but it would be perfect. I would use it for a good dip or a margarita! I would make so many things! I like to make blended pudding, sauces for pasta dishes, smoothies, and so much more. Our current blender is a joke, so a new one would be great! The first thing I would make in the blender would be some blender pancakes and a smoothie! this recipe looks amazing. I loveeee salmon! Sliders! Great choice for Super Bowl Sunday. We’re always looking for new pick-ups! Thanks for the recipe! i would make coconut yogurt . I would make a smoothie with fruits, veggies, peanut butter and some protein! We first inclination would be to make a good smoothie! I’d make my favorite banana nice cream! I’ve been really wanting to start making my own hummus, thanks for the chance! FYI, your link in the widget to the KitchenAid Twitter page is wrong. Salsa of course! Red, green! And smoothies too! The first thing I would make would absolutely be soup (duh 😉 ) I would probably make a creamy tomato soup to be paired with a grilled cheese sandwich… mouth is watering! I would make roasted tomatillos salsa! And then some creamed broccoli soup. Salmon has always been one of m favorites- those look delicious. If I won I would love to make a green smoothie! Oh man, these look soooo tasty. Mini food is just cuter as well, don’t you think?? Pinning! I would make soup. But my kids are gonna want milkshakes. I would first make a roasted red pepper hummus. I would make a delicious smoothie! I would make lava cakes! I would make a ton of different sweets! I would love to make first my mom’s special mayonnaise and your delicious recipe. I’d start off with a smoothie recipe using banana’s, oats, milk, splenda and vanilla. My old blender has given up so I am due for a new one. I’d make a creamy blended soup, with butternut squash or broccoli. I would make a smoothie first. I’m not sure on the kind of smoothie I’d make however. I would make a strawberry malted milkshake. A smoothie. I love a good smoothie. I would use my new blender to blend fresh tomatoes and chop onions for a delicious Bolognese sauce. Even though it’s still cold out, a gazpacho has been calling my name lately! I watched this video on how to make a cantaloupe mango smoothie with this blender and have been itching to try it out. I would make frozen margaritas. I would make smoothie right away! I would be making plenty of smoothies, I’ve been wanting to try this orange smoothie with chocolate in it.